Published: Aug 17, 2017 · Modified: Apr 12, 2019 · By Jen Sobjack · This post may contain affiliate links. 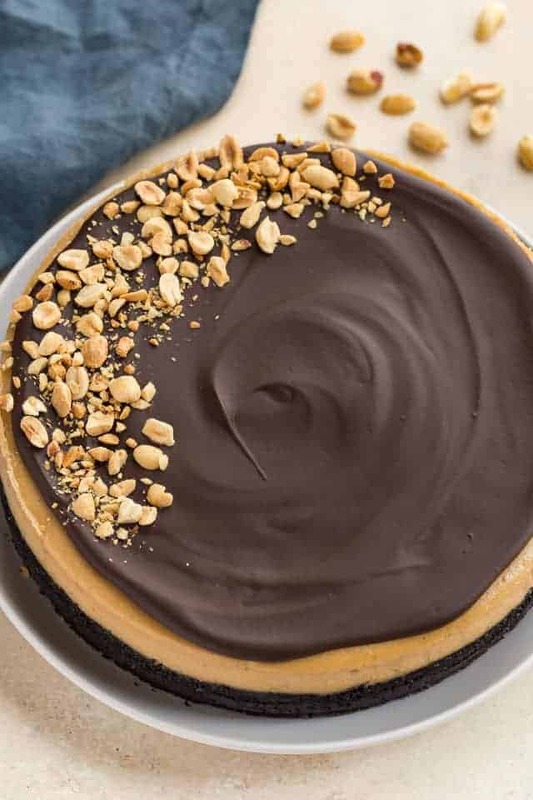 This Chocolate Peanut Butter Cheesecake starts with an Oreo cookie crust, followed by a rich peanut butter filling, then topped with chocolate ganache and chopped peanuts. It’s a decadent dessert that is well worth the effort of making a baked cheesecake. It’s no secret I love cheesecake. I have so many different cheesecake recipes on the blog and will continue to add to the collection. 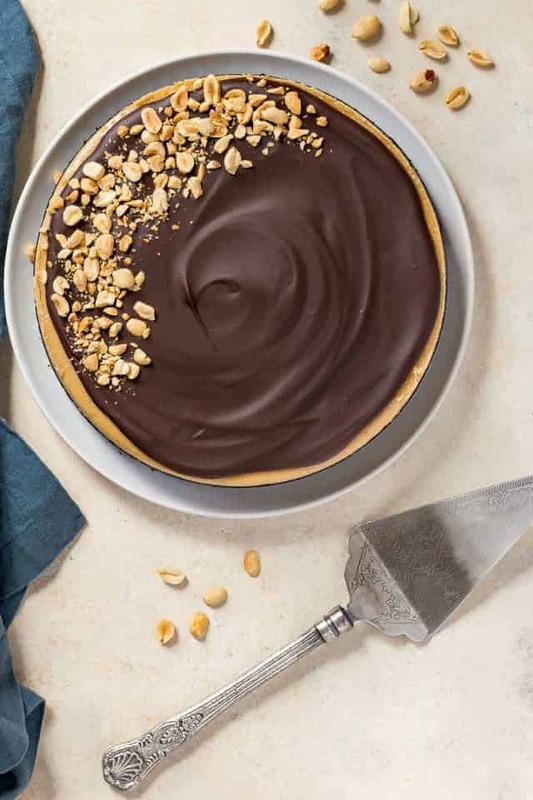 Today’s recipe is a play off my popular Nutella Cheesecake. The recipe is pretty much exactly the same with the exception of using peanut butter instead of Nutella. Make sure you read through my post on how to make the best cheesecake. There you’ll learn all of my favorite tips and tricks for making a perfect cheesecake. If you follow these tips, your cheesecakes will come out creamy and free of cracks. 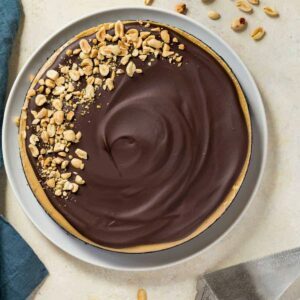 The chocolate peanut butter cheesecake begins with a chocolate crust made with chocolate filled Oreos just like my peanut butter pie recipe. You can use any fudge-filled sandwich cookie that resembles an Oreo. Pulverise 30 cookies in a food processor or smash them in a zip-top bag with a rolling pin. You should end up with about two and a half cups of cookie crumbs. Mix the crumbs with melted butter and press it into the bottom of a 9-inch springform pan. Bake the crust for 10 minutes at 350°F. The creamy peanut butter filling calls for cream cheese, heavy cream, sugar, vanilla, salt, peanut butter, and eggs. Basically, your staple cheesecake ingredients with the addition of peanut butter. I have a specific order for adding the ingredients to the filling. The reason behind this is to achieve an ultra creamy filling. So be sure to follow the recipe exactly when mixing the filling. First, beat the cream cheese until smooth and creamy. Then mix in the sugar, salt, vanilla until well combined. Beat in the cream until the filling is light and creamy. Mix in the peanut butter next. And finally, fold in lightly beaten eggs. Don’t use the mixer to beat in the eggs! It’s important that you fold them in with a spatula. Using a mixer will whip too much air into the eggs causing the cheesecake to puff up during baking. It will then deflate as it cools causing cracks to form on the surface. I preach this with every cheesecake I share with you. I’m sorry for constantly repeating myself but it’s really the most valuable cheesecake advice I can give you. Bake the cheesecake in a water bath at 300°F for one hour. Then, turn the oven off and let the cheesecake sit in the oven for another hour. Do not crack the oven door. I know a lot of other recipes tell you to crack the door, but don’t do it. Trust me on this. Leave the door closed to allow the oven to cool down slowly. This is a process you don’t want to rush because it also helps keep the top from cracking. After the cheesecake has cooled in the oven for an hour, it needs to sit at room temperature until it’s completely cool to the touch. Then, refrigerate it for at least 4 hours but overnight is best. I decided to top the cheesecake with chocolate ganache and garnish it with chopped peanuts. The ganache is super simple. Just warm heavy cream in a saucepan and pour it over chopped chocolate. Let it sit for a minute then stir it until melted and smooth. Spread it over the top of the cheesecake and pop it back in the refrigerator until it sets. 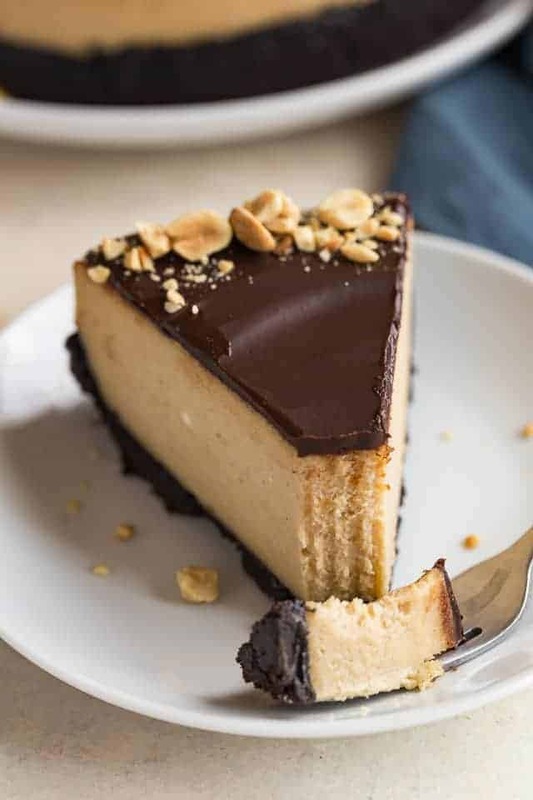 Cheesecakes are extremely time-consuming but one bite of this chocolate peanut butter cheesecake will make it all worthwhile. In a large mixing bowl beat the cream cheese with an electric mixer until smooth and creamy. Add the sugar, salt, and vanilla, beat on low speed until well combined. Add the heavy cream and beat on low speed until smooth. Add the peanut butter and beat until well incorporated. Scrape down the sides of the bowl as needed. Using a silicone spatula, gently stir in the eggs just until combined. Remove the cheesecake from the water bath and run a small knife around the outer edge of the cheesecake to loosen it from the pan. Allow it to cool completely to room temperature. (The cheesecake should not feel the slightest bit warm.) Refrigerate the cheesecake for at least 4 hours or overnight. Remove the sides of the pan and place the cheesecake on a serving platter. Bring the cream to a low boil over medium-low heat. Pour the warm cream over the chocolate in a medium bowl and stir to combine. Pour the glaze over the top of the cheesecake and use an offset spatula to smooth it over. Refrigerate for 20 minutes or until the glaze has set. The cheesecake will keep for up to 4 days covered and stored in the refrigerator. The cheesecake can be frozen for up to 3 months. Thaw overnight in the refrigerator. 1. Make sure the peanut butter you use is not natural. Choose a brand such as Jif®. 2. Stir the peanut butter well before using. Sometimes the oils will separate from the peanut butter and you need all that oily goodness to keep the cheesecake from drying out. 3. Start checking on the cheesecake after 30 minutes into baking. Oven temperatures vary and you may not need the full hour of bake time. Turn the oven off as soon as the edges of the cheesecake firm up but the center remains jiggly. How should I adjust the temp/bake time for smaller cakes like a 4 inch cake? I’ve not made this cheesecake in a 4-inch pan so I’m not sure how long it will need to bake. Maybe start checking for doneness after 30 minutes and go from there. The oven temperature should remain the same. Hi! How long will this cake keep? Can I keep it in the freezer for longer? The cheesecake will keep for up to 4 days covered and stored in the refrigerator. Or up to 3 months in the freezer. Thaw overnight in the refrigerator. My very first time making a real cheesecake and it turned out absolutely perfect!!! Not a single crack and the texture is perfect. I was terrified if ruining it with the water bath so I put an inch of boiling water in a hand sheet cake pan on the rack directly under the cake and it worked like a charm. Thank you so much! I’m going to try another variation fur Christmas. Hi, I followed your instructions closely and I used Jif peanut butter but there’s still oil separation. What could be wrong? Did I not mix enough? Jiff is already creamed and will not have oil separation. Only natural peanut butter will separate and need to be stirred before using. and a few new ideas for me – now I can’t wait to start making them again. I used to make four or five at Christmas time at Christmas time and give them to my friends for gifts as well as keeping 1/2 of each for family and friends’ dinner parties. A favourite one back in the day was the candycane no bake cheesecake. Do you have a recipe for that? I can’t wait to read your blogs and recipes – thank you for sharing! Hi Janice! Thank you so much for saying all those nice things! I’m extremely happy you find the site beneficial to you. I don’t have a recipe for a candy cane cheesecake but that’s a great idea for the holidays! Hey just want to ask, would this cheesecake hold in room temperature? Or does it need to be in the fridge until serving? It definitely needs time in the fridge to set but after that, I think it would be okay for about an hour at room temperature before serving. could you add things to the cheesecake mixture? like bits of oreo, or mini reese’s pieces? I actually haven’t tried add-ins with this recipe but I imagine it would work fine. Is it still meant to be jiggly after you pull it out of the oven? Will it set once it’s been in the fridge? Yes, the edges of the cheesecake should be firm and the center jiggly. It will set once it has been cooled and refrigerated for at least 4 hours. Planning on making this for Thanksgiving this year. I hope it’ll turn out well. Will Skippy brand peanut butter work well? Skippy should work just fine. You just don’t want to use anything that’s labeled “all natural”. I’ve made a few cheesecakes with Oreo cookies crumbs for the crust, but I’m a bit confused by your recipe. Do you mean for us to use the fudge in the middle of the cookie? I’ve never used it before and am afraid it will make the crust too sweet. Please clarify. I always leave the filling in the cookies because I don’t have time to scrape it out nor do I like to waste it. And I find that using the filling gives the crust more structure. It’s like a glue that holds all the crumbs together. I personally don’t think it’s too sweet but everyone has different tastes. Do you whatever best suits yours. Just curious, why can you not use a natural peanut butter? Natural peanut butter has a higher oil content and could possible separate during baking. That could potentially ruin the cheesecake. Looked so amazing I tried making it at home! I have a question though, I followed your instructions to a T and yet it seems as though it’s overbaked and quite dense. Mine was not “firm around the edges and gooey in the middle”, but rather firm all around after the 2 hours. Can you help me figure out what went wrong? I’d love to nail it next time. Thanks! Oven temperatures can vary. Because of this, you may not need the full hour of baking. Start checking the cheesecake after about 30 minutes. Once the edges are firm but the center remains jiggly, turn the oven off and leave the cheesecake in the oven for an hour to slowly cool down. Also, make sure you’re not using natural peanut butter. Jif® works well for this recipe. Making this cheesecake as I write for my husband’s birthday. I made the coffee cake recipe that you posted with the cinnamon swirl and it was divine. Love, Love, love your recipes. Pure. Perfection. Cannot get over how beautiful and delicious this looks. Definitely need to try soon! I had a friend that had cancer and until he passed away i would make him a treat sort of like this. It was the only thing he could taste. I think this is a sign I need to enjoy a few pieces for him. Yum!